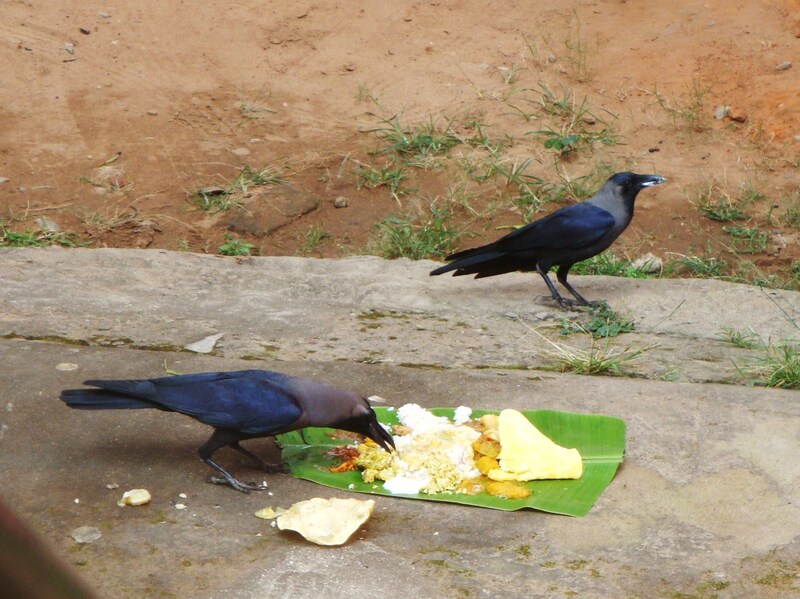 Crows getting the initial share of the feast prepared on the first death anniversary (of the L & M’s mother). In the old days, these crows with the grey band around their necks were chased away from such offering. Only the fully black ones were allowed to partake of the feast. It was believed that the dead returned as the latter to accept the lovingly prepared food. The crows with gray band were referred to as kalla-kaakka (liar crows) which made us children ask the (inevitable) question if the fully-black ones were ‘satya-kakka‘ (truthful crows)?! Times have changed. There are fewer crows and it would not do for anyone to fuss and insist that only one type of crow is welcome. May be that’s why the kalla-kakkas of before are welcomed by most, accepted as the form the dear departed souls have assumed to return and accept their offerings. Or maybe it is the departed souls who have made the compromise. Anyways, nowadays you find both types of crows are welcome to peck at the food lovingly prepared in honor of the dead souls. But today we had another unexpected visitor apart from the expected crows: a hungry old woman. I can imagine a hungry person taking exception to their photograph being clicked. Did she mind? The pic tells me that we should feed not only the birds but hungry people…too……. !!!!!! 🙂 Yeah I know Usha. I had once asked that if the since the soul of the said person has passed on to the after life and enjoying all that is good in heaven, why would they want to come back? Or what if they’re re-incarnated? It didn’t go well with the people Uncle an aunt. Anyway, feeding the hungry is a good thing.. Personally I don’t believe in all this and think that these are rituals for those left behind to find closure (not those departed). I’d rather my body be donated to science. Let me not even talk about the racket (rituals for the departed done by a set of clueless people for another equally if not more clueless set of people) that is a booming business these days. Loved this post Shail. 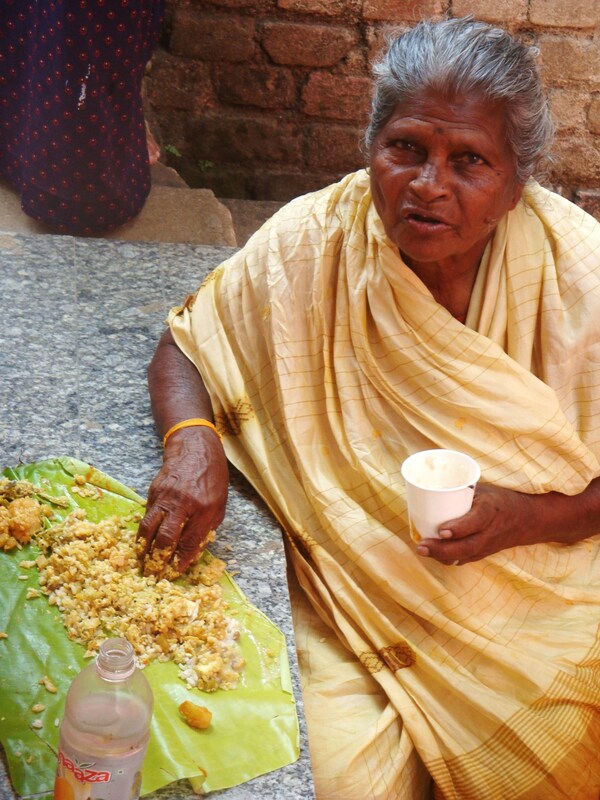 My mother sends food every year to the slums from where our household help of 30 years comes. I know that some of these customs don’t help is the bereaved, the mother who I am in touch with, who lost her 24 year old daughter last Feb found feeding of food to crows extremely upsetting. If the purpose is to help the loved ones, only what they find comforting and the way they find it comforting should be followed, anything else is just not necessary. That is such a lovely gesture on your mother’s part IHM. And I agree, what makes the loved ones feel comfortable is all that’s needed to be done. I remember the time when my brother-in-law passed away. My son was only two. He was snatched off my hand by a relative to do the last rites. He screamed and screamed, terrified. We had just come down from the North after two days journey and my son was not even familiar with all members of the household and here was this distant relative who just took him away without a word to me. He carried him around and did all the necessary rites on my son’s behalf. I watched livid… but helpless, being still the new entrant. Moreover it was a house of mourning. What annoyed me most was the way he was snatched from me, as if my permission was not needed for taking my son away from me. That just shows the patriarchal mentality. The second, I could easily have done the same on behalf of my son without upsetting him. To this day I question such meaningless actions where babies are forced to do rites. Aren’t rites and rituals supposed to be for those who understand its significance? OMG, this is a blog post of a comment! When my grandmother passed away we decided not to give a feast to all the relatives on her shradh. Instead we decided to give food to people who really need it … especially since my grandma had spent her life looking after the needy. Also my aunt was allowed to go to Haridwar to immerse the ashes along with my father ,, so yes times are changing ! But I agree .. these rituals are more for the benefit of the living rather than the dead ! I am so glad when I hear of such changes. The rituals for the dead is a booming business everywhere. No one knows what or why they are doing, but they do it all the same to be on the safe side. And THAT I find meaningless. My MiL always fed the crows before having lunch. My grandfather also used to do the same. When I go to shraadh ceremonies and see the useless pomp and show and inane chatter, I am yet again convinced that it is a useless exercise. Doing something for the needy is a much better option. Thank you for this post, Shail :). Loved it. Didnt know the relevence of fully-black kaakkas and kalla-kaakkas :). May God be with the departed souls. Nowadays I don’t see anyone talking about the kalla kaakka (also called kadal kaakka, it is seen near the sea) and the fully black ones. It is only one ‘kaakka’ for all. hmm interesting info .. I did not know this at all about the fully black or the grey necked crows ..
God bless and rest in peace the departed souls ..
We call the complete black crows as ‘andangaakka’. I feel they are villain kaakkaas, since they don’t allow the grey ones to eat food. I place curd rice everyday to kaakkaas, first because my mother was doing this, but now, I enjoy watching them eat. I did a post on this. I too agree with you, instead of inviting all and sundry to eat in our house, we can feed the poor in some orphanage. The old lady looks so happy, Shail! Your mother in law must be happy seeing this happy face. Yeah those crows are a bit bossy! I have noticed too. There are people we can help in many ways instead. So many children who need books/uniform or other necessary items. Can you give me the link to your crow post? Welcome to Shail’s Nest Vethal. I wonder why we are so focused on feeding those who already have enough?